Vertical- and Short-Takeoff and Landing (V/STOL) aircraft can take off and land vertically, similar to a helicopter, and yet can fly in the air at high speeds similarly to a fixed wing aircraft. Takeoff and landing are possible without a runway. Moreover, long-distance transport can be achieved at high speeds. Therefore, VTOL/STOL is anticipated as a future technology to reduce travel time for air transportation while vastly improving ground space utilization. As part of JAXA's advanced technology research, "New aviation field creation program (Sky Frontier)" for innovation of future air transportation potential, we are currently pursuing research on VTOL/STOL technology. 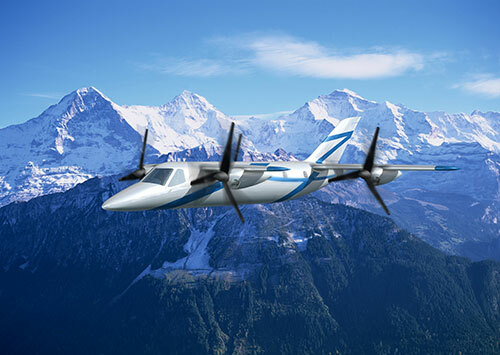 Vertical takeoff and landing, as well as cruising, are made possible by four propellers mounted on two main wings, which can be rotated.